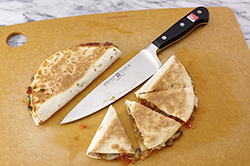 What goes inside a quesadilla varies from region to region, but all of them are cheese-stuffed tortillas that are cooked until the cheese melts and the tortillas are nice and toasty on the outside. This is a vegetarian version – great for a light lunch or an appetizer for a fancier dinner with a side of guacamole, sour cream, and/or your choice of salsa. 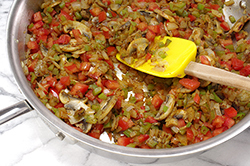 Heat about 1 tablespoon vegetable oil in a large pan over medium high heat. 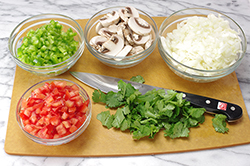 Add the onion, bell pepper, and mushrooms and sauté until the onion is translucent and the bell pepper is limp, 3 to 4 minutes. Add the tomatoes and the chili powder and toss. Remove from heat (the tomatoes will continue to cook a bit in the hot pan). In a separate pan, heat about 1 teaspoon vegetable oil over medium-low heat. Take one tortilla and place it in the pan. Spoon about one-sixth of the vegetable mix onto half of the tortilla, sprinkle on about 2-1/2 tablespoons cheese and a bit of the cilantro, and fold the tortilla in half. Put another tortilla in the pan and repeat. 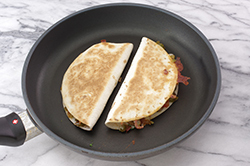 Now you should have two quesadillas cooking in the pan. 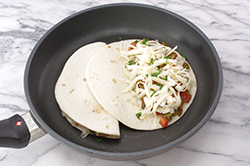 Cook until the cheese has melted and the tortillas are crispy and golden brown on both sides, 3 to 4 minutes for each side. 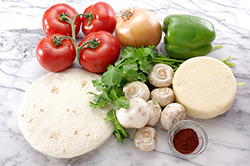 Place the quesadillas onto a cutting board and repeat the process (adding a bit more oil to the pan, as necessary) until all the tortillas and filling are used up. 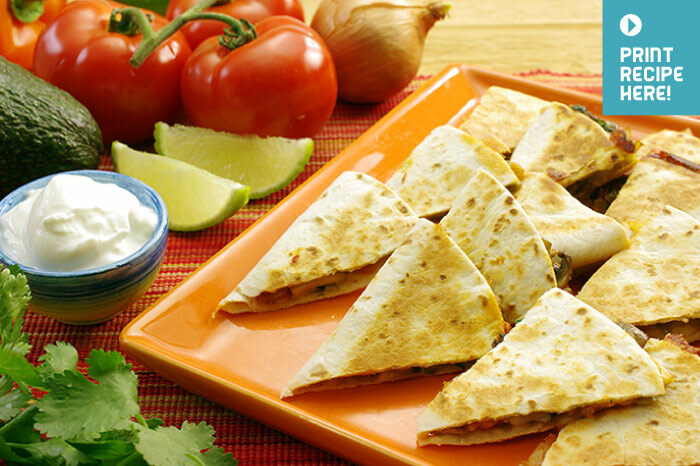 Cut the quesadillas into three wedges each and serve.